Due to fungus, bugs, and perhaps the psychological distress of destructive boys invading their ecosystem, we’ve lost several trees. 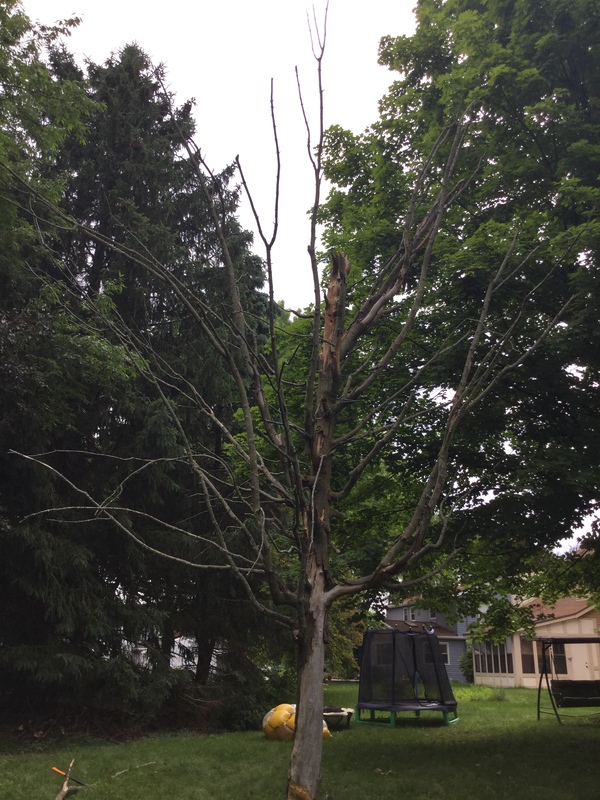 We can’t say which of the above killed the Maple in the back yard, but it joined the ranks of the standing dead a while ago. Falling limbs have turned this tree into a minor hazard. A branch could fall on one of the kids, but childhood is fraught with risks, so I let that slide. My Edgar Allen Poe tree gave the back yard a Gothic charm, and the kids need to learn to keep their heads up anyway. But when a snagged branch poked me in the temple last time I tried to mow around the trunk, it was the last straw. That menace was about to fall like the House of Usher. It’s curtains for you, Edgar. Our neighbor owns an electric chain saw that she’d borrowed back from us for a few days, since we weren’t using it. In order to determine whether the chainsaw had the horsepower to cut through the trunk, before I went to the trouble of reclaiming it from its owner, I gave the trunk a couple whacks with my ax. (Technically, it’s a splitting maul, but splitting mauls don’t capture the imagination like axes do). The wood wasn’t so tough, so I gave it a few more whacks. Those few more whacks turned me into Paul Bunyan. The notion of chopping down a tree with an ax captivated me. 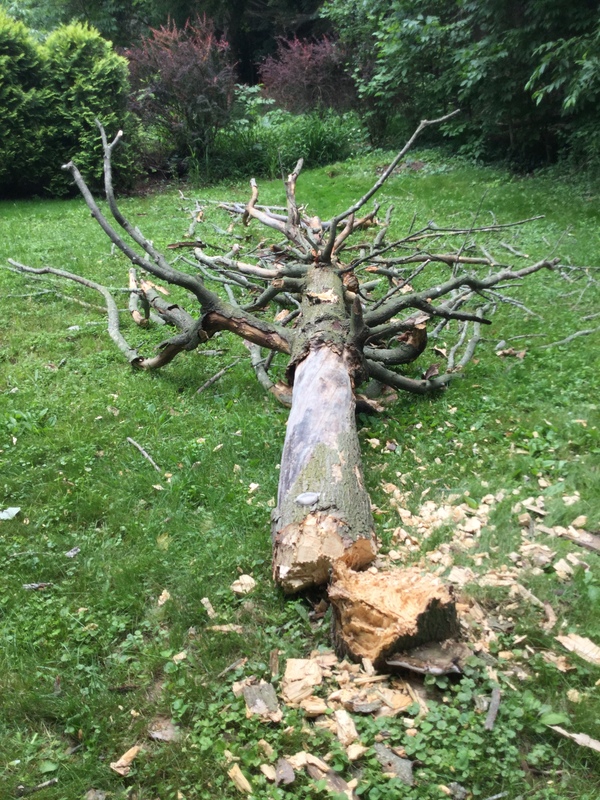 Why shouldn’t a man chop down a tree with his bare hands instead of waiting until the lady next door gets home so he can borrow her power tools? An old lumberjacks’ trick: use your rest breaks to take pictures. I always like to find activities to distract my masculinity before it turns toxic. Chopping down this tree had my masculinity skipping like a child in knee pants. I highly recommend the activity to anyone suffering dangerous levels of manliness. After some short breaks to catch my breath, because my woodsman skills have been in decline for the past six generations, I toppled the tree with a soul-satisfying crash. I put my ax away and, just like the true pioneers of yesteryear, went inside for a well-deserved Gatorade. “You didn’t rush to see if I were hurt?” I asked. “I sent the little one to look out the window,” she reassured me. Every strong man needs a good woman. Seriously, she would have paused her movie if the preschooler’s assessment of my injuries warranted such drastic action. Didn’t even hit the house with it. Having reassured my worried family, I went out to clean up the debris. I thought I might build a log cabin out of my timber, but our frontier Homeowners Association won’t let us put up a 4×4 shed, so they probably wouldn’t approve my sod roof designs. I cannot tell a lie; there’s a euphoria in going all George Washington on a Cherry (okay, Maple) tree. It’s a stirring experience – makes you want to party like it’s 1799. This entry was posted in It's a Guy Thing and tagged Dads, Edgar Allen Poe, fatherhood, George Washington, humor, lumberjack, maple tree, woodsman, yard work. ← Mr. Owl, why do they keep making brown Tootsie Pops? Well done. Your conversation with your wife cracked me up. When it came to killing spirits, that tree gave as good as it got. I’ll look for brown Gatorade next time I’m in the store. Way to go. Hope being all Paul Bunion didn’t cause you any bunions. Hilarious with your wife and even funnier that your neighbour had to borrow her chainsaw back from you. Also I’ve learned something new. They drank Gatorade in yesteryear? And they took pics during chopping breaks. What I’d die without knowing if I didn’t follow bloggers. I’m surprised they didn’t teach you that stuff in school. Canada! Heck they don’t even teach cursive anymore. Sad but shockingly true. I’m sure there’s a blogger out there who can teach it to you. I love dead trees! They look so cool, although I daresay taking yours down was the right thing to do. That said, I’m glad all my trees are alive currently, although they do lose branches during wind storms. I recently hacked down a dead pricker tree and two live, um, what are they, elms? 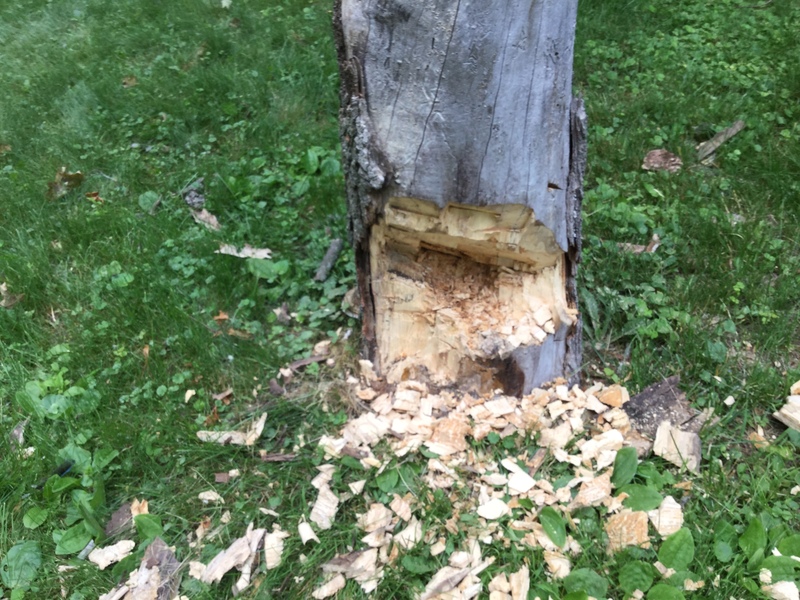 The trunks were about 4″ diameter; I used a hack saw, since we do not have an axe, hatchet, or whatever it was you said, first cutting back on the branches with clippers. I felt like much woman, to borrow a phrase from my sister. Great post. I prefer live trees in my yard, though it seems every summer we get a new insect that kills a different type of tree. But I’m glad I don’t have to rely on a hacksaw to clear the dead ones. Way to show some of that Herkimer County Grit! I love it. A man and an ax. What a concept. My neighbor recently had to borrow back his electric hedge clippers which I borrowed while he was away – about five years ago. Apparently, you needed them more than he did. Don’t let him forget to give them back. I have my own. I just didn’t know it. I definitely appreciate the timber of this tale, Scott, and the timbre rings for me, too. I have to hand it to you, Mark. You really know how to swing a homophone. For your next re-visitation to the past—build a pyre with the limbs over the stump. Enjoy s’mores In honor of Paul Bunyan and his ax! And wind up in the Ingham County gaol as a firebug. Yes. My masculinity dare not take itself too seriously. Good job, Scott! Your entire post had me giggling. You are just so funny. Now you can feel like a real HE-MAN. Thank goodness your wife was so concerned! Since then I’ve HE-MANed that tree into little pieces. My wife’s concern has held steady.